Black bean soup has always been problematic for me. I love black beans, but they don't lend themselves well to just any recipe. I used to think they should be interchangeable with pinto beans, but they're not. They're more firm, so they don't blend into their surroundings quite as well. 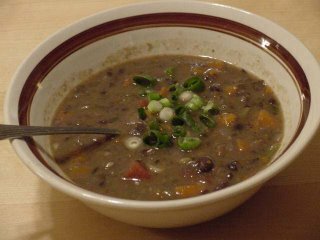 I've always liked the idea of black bean soup, but the reality is usually less than the sum of its parts. And then I found this recipe in one of my brother's cookbooks in Austin. It had all of the usual suspects, so there was little reason for me to believe it would come out any better than my earlier efforts, but I decided to give it a try anyway. And it came out really well. What's different? The flavors blend together. It's not just black beans surrounded by a flavroed broth. It's soup. Maybe it's just that my taste buds have changed over the years, or maybe it's this recipe. At any rate, I heartily recommend it. I used my handy dandy super duper hand immersion blender to puree the soup; I just stopped about halfway through. My only complaint? The fresh jalapeno I used had No. Heat. Whatsoever. Nada. Zip. From now on, I use the pickled peppers that come in the cans (or jars). They're always reliably hot. Place beans and water in saucepan and cook for app. 45 mins., reserving 4 c. cooking liquid, and set aside. Heat oil in saucepan and add onion, bell pepper, celery, garlic and jalapeno. Saute for 7 mins. over med. heat, until vegetables are tender. Add carrots, beans, reserved cooking liquid, sherry, and all of the seasonings except salt. Bring to a simmer and cook for about 20 mins., stirring occasionally. tir in crushed tomatoes and salt and cook for 10-15 mins. more. If you prefer thick soup, puree half in a food processor fitted with the steel blade and return to pan. Add salt. Ladle soup into bowls and sprinkle scallions over the top. I think I might try and make this over the weekend. Consumantron Kevin was going on about black beans a few days ago, so now I have a craving.